John Schlesinger presents a site-responsive installation rooted in the ceiling and walls of the gallery. 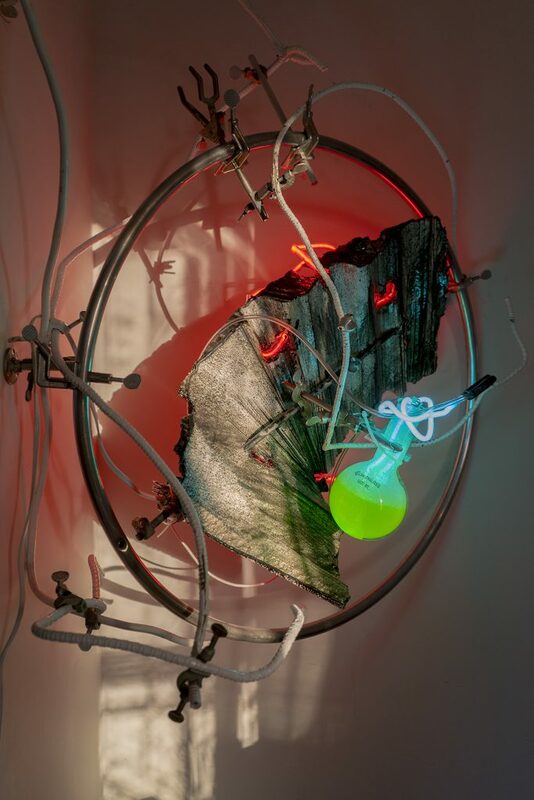 The installation connects twisted, salvaged demolition rebar, bent neon, resin-soaked photographs, projected video, found waste, shattered glass, and cast bronze sculptures into a fragmented, transient landscape. The natural, built, and broken strangely fit together and, at the same time, teeter on the brink of collapse. Schlesinger pushes his amalgamations into a state of contingent possibility rather than something final and finished. An acclaimed, experimental photographer and immersive installation collaborator with Dear Volunteers and Tra Bouscaren, Schlesinger fuses his photographic glimpses- bits and pieces torn from the landscape by the camera and then by the hand- with sculpture, space, and illumination. Neon lines blink and mimic the shape of rebar; or a photograph of a power line; or the shape of an actual power cord. The eye and mind are drawn to surfaces, structures, materials, and textures clamped together in unpredictable relationships. Ruin and re-invention, nostalgia and fact, accidents and intentions cling to each other in elegant and odd arrangements. About the Artist: John Schlesinger is a veteran photographer turned sculptor. He has won a Rome Prize, a Louis Comfort Tiffany Award, a Peter S. Reed Foundation Award and two National Endowment for the Arts Fellowships. His work has been reviewed in Art in America, the Village Voice, Aperture, Bomb Magazine, Art News, and the New York Times. Collected broadly, Schlesinger’s output can be found at the Walker Art Center, the San Francisco Museum of Modern Art, the Houston Museum of Art, the Dallas Museum of Art, the Hamburg Kunsthalle, the Art Institute of Chicago, the Brooklyn Museum, and the MOMA. He is currently a CFEVA Fellow in Philadelphia.